The 2099 UnderGround Revised is always on the lookout for new authors to join our ever expanding alliance of scribes of the future! The 2099UGR has an evolving and rich story tradition where the opportunities for new authors are not limited by a complex history. If you think you have what it takes, we want you to join us! However, it is the responsibility of the Editor-in-Chief to ensure that all of the stories put out by the 2099UGR are of the high quality and caliber that our readers have every right to expect. Some stories are going to be appropriate for the 2099 Universe, and others may have a better chance at being showcased in another fan fiction forum. To be sure that we all start off on the same page, here are some basic guidelines for you as a new writer to follow to have the best chance at being a mighty 2099 UGRevised author! This is the FUTURE . . . The year is 2099, and the Marvel Universe has changed since the time of Spider-man, the X-men, the Fantastic Four, and the Avengers. The governments of most countries are now controlled by the powerhouses of industry, giant corporations with their greedy fingers in all walks of life, now called "megacorps". This is a world where justice can be bought with a black card, a symbol of avarice and status. There are designer drugs, legally distributed to the addicted slaves of the middle class by those with the proper license, and illegally tested on the destitute and downtrodden masses barely surviving in the underbellies of the great cities. There are fantastic technological advances like holographic servants and cybernetic worlds of beauty and adventure, that are available only to the privileged few. There are hidden terrors of alien technologies capable of vast destruction in secret vaults guarded by madmen, and there are those who have immortalized the heroes of the past as icons of religious worship. There are orphans hiding in cities where only mutants are allowed, and gladiator arenas where the rich and the bloodthirsty plug into the worst kind of spectacle since the days of the Roman emperors. This is a world where the super heroes of the past were no more, until . . . LESSON ONE: THESE STORIES TAKE PLACE A CENTURY IN THE FUTURE. This is not your friendly neighborhood 20th century. This is not even the Marvel Universe you may know like the back of your hand. It is The Future (tm), and things have changed. In order for your story to be a believable part of the 2099UGR universe, it must exist in a believable future. Everything is different here, and you must show us that you understand this world and can create a plausible future world for your stories. Although there are a lot of cool things already in place in the world of 2099, you are free to be as inventive as you like in how you populate that future with machinery, characters, and gadgets. Originality and creativity count for a lot here. The world of 2099 owes a lot more to science fiction than fantasy, and we here at the 2099 UnderGround Revised want to continue in that tradition. That doesn't mean that your story has to have entirely original characters. We have a number of faces in the 2099 UGRevised universe that you might recognize. But please do not rehash some old tired characters from the Marvel Universe and expect it to fly. Transporting "Character X" into the 2099 Universe via a time-machine isn't going to cut it (it's been done already, and it's not like there are a million time machines out there for every character from the 20th century to hop aboard!). The only way a story like that is going to work is if it is exceptionally original in some other way. Also, characters that reuse a twentieth-century character's name must be different enough from the original to seem like an entirely new character. For instance, Spider-Man 2099's personality is almost apolar opposite of Peter Parker's, and the Doom of 2099 has changed quite a bit from the Victor Von Doom of the twentieth century, even though they're allegedly the same character. As far as impressing the editors, name recognition goes a long way, meaning characters that have already appeared in the 2099 Universe will be your best bet. Not familiar with those characters? Do some research. Back issues of almost all of the 2099 books are very affordable right now in comic-store back issue bins and in online distributors. These characters do not have to be major heroes either. There are a lot of supporting characters with potentially interesting pasts and futures who were never fully explored in the regular stories. If you use one of these more obscure characters, be sure to reference their appearance by issue name and number. We don't want to mistakenly use any dead characters unless you've explained how they were resurrected. Remember also, that 2099: World of Tomorrow and many of the later issues of the Marvel runs are not part of the continuity of the 2099 UnderGround Revised. LESSON TWO: EVERY NEW WRITER WILL BE ASKED TO SUBMIT A WRITING SAMPLE ANDOR COMPLETE AT LEAST ONE SHORT STORY IN 2099UGR UNLIMITED OR MINI-SERIES BEFORE THEY WILL BE CONSIDERED FOR AN ON-GOING SERIES. Why is that you ask? Well, experience has shown us that it is extremely difficult for most new authors to put together and complete a cohesive story. Plus, the editors need to see your stuff before they accept any other proposals from you. Writing a series can be a lot of work. Many new writers have elaborate, multi-issue ideas and plots for the next 25 issues already planned in their head, yet they never get past issue number two when they actually realize how difficult it is to write it all down. The truth about writing stories is, it is work. It is hard work. The ideas are the easy part; everyone has ideas. Writing out the ideas in an interesting and intriguing story is the really challenging -- and sometimes tedious -- part. Believe us, we know. To quote an anonymous writer: "Writers are people for whom the act of writing is more difficult than it is for most other people." In other words, writers care enough about writing to make it hard on themselves. 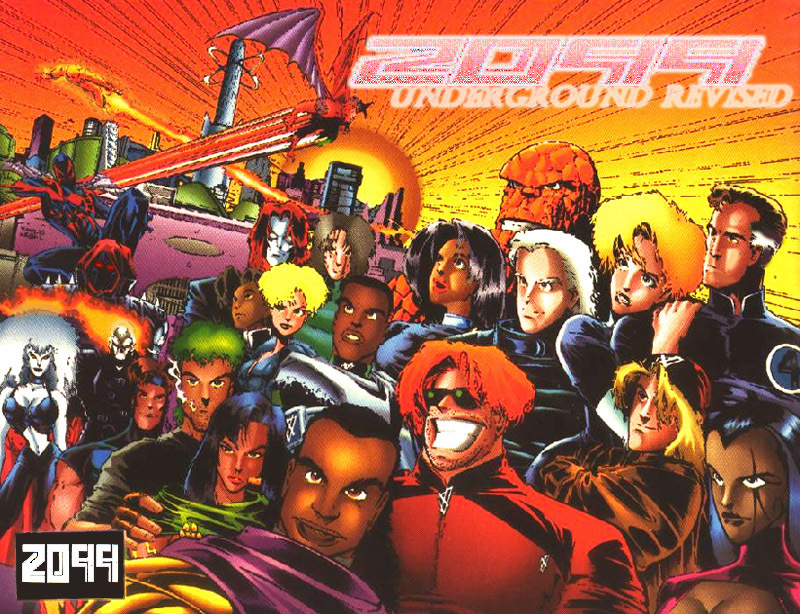 Another factor is that 2099 UnderGround Revised will stand behind each and every one of our writers, and we will promote them and support them and your project in every way possible. But we must ask that you prove yourself and your abilities first, before we commit our resources and time and energy to your project. We also do not want to make promises to our readers that we cannot keep. They are a very important part of the 2099UGR, and we do not want to disappoint them. Also, doing short stories is good practice for budding writers. Every short story should have a beginning, a middle, and an end. By concentrating on developing plots in this fashion, you learn what it takes to craft a story that will intrigue the readers, and if your characters are interesting and well drawn out, then hopefully we'll want to see more of them. But each short story you write is required to be self contained, with no dangling plot threads or cliffhanger endings. When you get to the point of writing a series, then you can develop multiple subplots and get the feel for leading the readers on a grand adventure that leaves them begging for more! Limited series also must have a beginning, middle and an end. The limited series stories that we will approve are just short stories strung together. Limited series will be no more than five issues in length. Please do not commit to a limited series if you are not able to uphold your end of the bargain. New writers may be required to submit all issues of a limited series before it will be distributed. Otherwise, we will expect on average one new issue at least once every three months. That's a lot of time to write a story, so you should be able to do it. If not, consider trimming your story down into a single issue short story format. Continuing series have an unlimited number of issues, as decided upon by the author and the editors. As with the limited series, you should expect to be able to write a new issue at a minimum of once every three months, although a monthly release is preferred (mostly to keep your characters and storylines fresh in the minds of the readers). We don't have any hard and fast rules on this however, because a lot depends on what you have been able to put out historically for the 2099 UGRevised, and we'll work with you on this. If you've gotten to the point of being an ongoing series author, we want to do what we can to keep you that way! How long should these stories be? For the most part, that's up to the individual author. Some stories run long (in fact, some series here are longer than your regular novel), others can be done in less than ten pages. Average is about 8 to 12, typewritten single space pages. Or consider this: a short story is one that you can comfortably read in one sitting from start to finish. If you send us a fifty page dissertation, then you're missing the point of "short story", and you'll likely be told to break the story into separate pieces. LESSON THREE: HOW THE DEAL WORKS. All submissions go to both the EiC and the AEiC. You may submit your proposal in the body of the e-mail, or as an attachment. If you send an attached file, it must be in plain TEXT format only, and checked for viruses before sending. If you're not sure how to do this, contact the editors for further details. Now is a good time to learn. All stories you send to the 2099 UGR must be sent in either TEXT or WORDPAD format if sent as attached files. Keep it as plain as possible to avoid any messy conversion problems. Each writer will be given a 12 issue block or less on a title. Remember, continuity is the word for the 2099 UGRevised. So, please keep everyone informed on the staff of your plots and major events you have planned. New Characters and New Villains: Include a brief description of each new major character, brief history, physical characteristics, powers, and motivations. No more than one paragraph each. New groups should also be described in this fashion. Plot Summary: Synopsis of the plot. Usually no more than one page per short story or issue. If a limited series, include a plot summary for each issue. If an ongoing series, include a plot summary for at least three issues and general direction of the book. You may be asked for additional plot summaries before final approval. Short Stories or one-shots: attach if completed. Submissions with completed stories have a better chance of approval than those without one. Plus it is an easy way to see if your writing skills are up to the level we are looking for. Previous Stories Written: (either for 2099UGR or other fan fiction groups). Story samples may be requested before story approval, but are not necessary for new authors. The editors will look over your proposal and determine if you've met all of the requirements described above. You may receive an email that thanks you for the submission, but that your story doesn't appear to belong in the 2099 universe. You may receive an email asking for more information. Or you may hear nothing at all for a while. Please be patient. If your submission is forwarded to the editor, we will notify you of our decision as soon as we can. Upon being accepted, the EIC will contact you with more information on how the site is conducted internally. You and the EIC will have a short discussion of the rules and regulations of the group. This may seem like a lot, but once you are rolling it takes no time at all. These are not strict rules, but guidelines to help those looking to write for the 2099 UnderGround Revised on how to structure their ideas. We look forward to hearing your ideas!